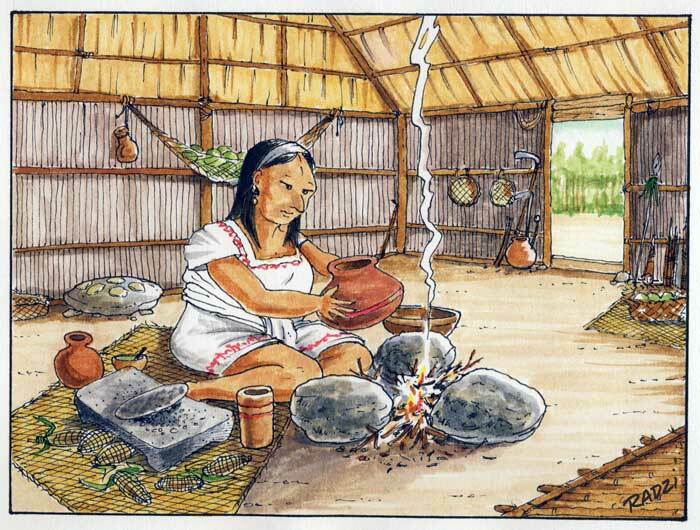 Actually cooking was usually done either in a separate kitchen, or outside, under the overhanging thatch eaves (one scholar writes that most Maya houses ‘had more roofed space outside the walls than inside’). 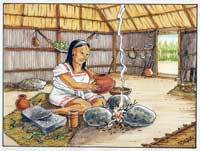 Furniture was sparse and practical: beds (with cotton blankets), a bench (more likely made of adobe or mud brick than wooden), cooking equipment, work tools (farming, spinning...), plenty of ceramic pots for cooking and for storing and carrying water and grains... If the family could afford it, the lower part of the walls might be made of stone and/or painted with lime whitewash to lighten the feeling of the room a little (see pic 1), and floors might be raised slightly, on adobe platforms (occasionally wooden floor boards were used). 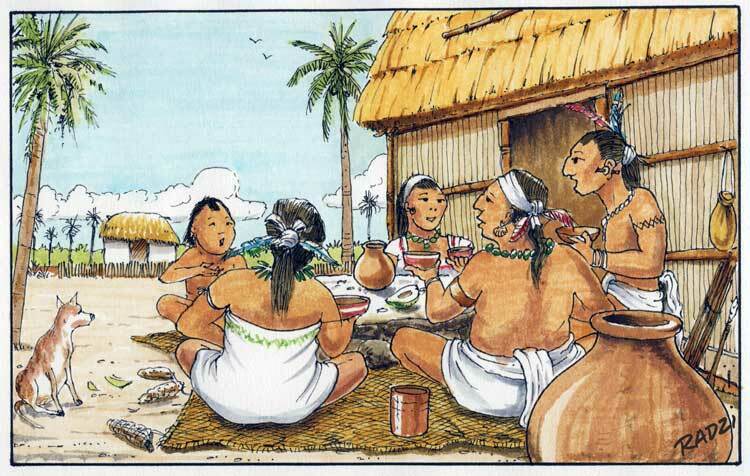 Meals could be taken outdoors or indoors; some accounts suggest that women and men ate separately, and the menfolk were always fed first, followed by the ladies! Very generally, the men did the farming, harvesting, house-building (this was always carried out communally, shared with other families), repair work, firewood chopping, and tool making and servicing, whilst the women did the cooking, cleaning, weaving and spinning, pottery and gourd making, animal raising, gardening, and marketing. • B/w reconstruction drawing of a patio group at Aguateca by Takeshi Inomata, scanned from our own copy of The Classic Maya by Stephen D. Houston and Takeshi Inomata, Cambridge University Press, 2009, p. 225. Info from various sources, but mainly The Classic Maya, above.